One enzyme in the PKC family, PKCα, plays a direct role in facilitating synaptic plasticity. When PKCα activity is perturbed, plasticity is subsequently disrupted; demonstrating that the protein is a critical first step in the initial molecular cascade. PKCα also has very robust activation and is rather spine specific, confining its activity to only the stimulated spine and not spreading to the surrounding dendrites. A unique discovery of the study, found that PKCα acts to integrate two temporally distinctive signaling pathways both known to be critical for synaptic plasticity. The first is BDNF mediated, a slower, diffuse signal developing over minutes and the second, is NMDA receptor mediated calcium influx, a spine-specific signal occurring in a matter of milliseconds and necessary to begin the rapid molecular cascade of synaptic plasticity. Adaptably responding to both of these signals, PKCα is able to sample recent synaptic history and integrate it with current synaptic events, enabling complex processing of information at the single spine level. Investigating these intriguing findings further, the team was able to successfully link molecules to memory, uncovering that PKCα is required for efficiency of learning. Mice with PKCα removed from the brain, take a significantly longer amount of time to become proficient at a learning task than counterparts containing intact PKCα protein. Despite this lengthier learning curve, if given additional training, mice lacking PKCα will eventually learn the task just as well as wild type mice; supporting the notion that PKCα is critical for encoding a memory but may not play a significant role in the recall of a memory once it’s established. Model of integration of TrkB and calcium signals to induce PKCα activation in paired and unpaired subthreshold stimulations. A subthreshold stimulus that was unable to induce plasticity was given alone (unpaired) or after a nearby plasticity-inducing stimulation (paired). Unpaired, the stimulus could not activate PKCα or induce plasticity. However, when paired with recent plasticity in a nearby spine, which induces a long-lasting, spreading TrkB activity, this same subthreshold stimulus led to PKCα activation and plasticity. 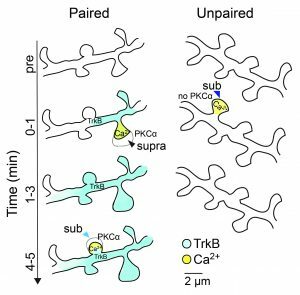 PKCα integrates spatiotemporally distinct Ca2+ and autocrine BDNF signaling to facilitate synaptic plasticity. Nature Neuroscience, July 16 2018, Early Release.